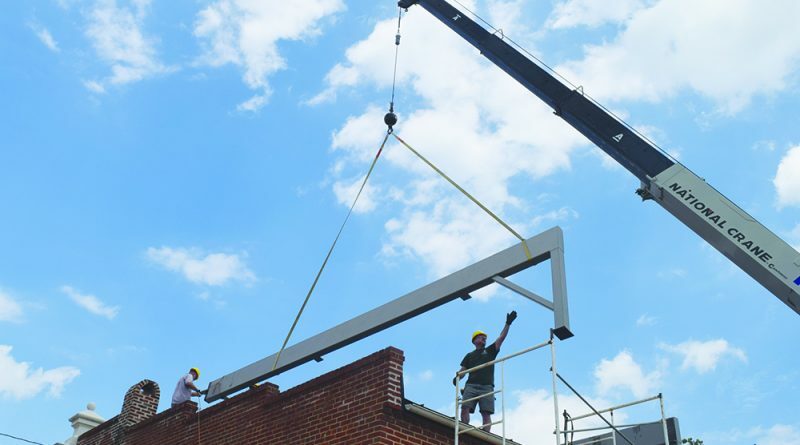 Crews maneuver steel beams into place atop the former BB&T Bank building on West Market Street in Leesburg. Later this year it will be space for rooftop dining. 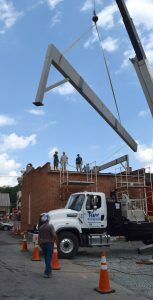 Plans to convert a former BB&T Bank building into a downtown tequila bar continued to take shape last week when steel trusses were put in place for the restaurant’s rooftop deck. Builder Paul Reimers is undertaking the adaptive reuse of the building, located at 7 W. Market St., making new space for a Mexican restaurant and apartments. Restaurateurs Jason Lage and Rebecca Dudley, both of the popular Market Table Bistro in Lovettsville, will take over the food and beverage side of the operation once construction is complete later this year. Lage has said that the tequila bar and restaurant will give the public a different concept of authentic Mexican food, as well as tequila and mezcal, another liquor made from the agave plant.